The last Adesso keyboard I reviewed was the WKB-4000BB, and it was a netbook-sized keyboard for syncing with a PC, laptop, or even mobile device. I just had a chance to try out the WKB-4200UB, which is a regular-sized keyboard that isn’t really that different from the former model, really. Then again, I’ve reviewed many wireless keyboards, and there isn’t much to distinguish one from the other. I will say that this model of wireless keyboard does have the advantage of having a “power-off” button, something that is surprisingly a new feature from the Adesso wireless keyboards. I suppose that would make it the king of the Adesso wireless keyboards, and there are more features after the jump. The USB dongle has a wireless connection with 2.4 GHz RF Smartlink with 12 Auto-Changeable channels, and it linked with my computer right away. Turning the power on and off caused no delay in the wireless connection, and the keyboard works instantly, provided you have the 2 AA batteries to power it. 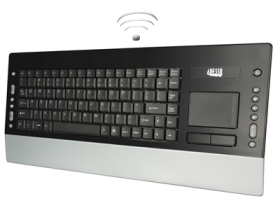 The Wireless Slimtouch Pro has a trackpad with two buttons, as well as Internet hotkeys (Home, Scroll Up, Scroll Down, E-mail, Forward, and Back) and Multimedia hotkeys (Play/Pause, Stop, Previous Track, Next Track, Volume Up, Volume Down, and Mute). There are also three PC hotkeys of My Computer, Search, and Sleep. You should be able to purchase the Adesso WKB-4200UB Wirless SlimTouch Pro on the Adesso shop site for $119.99.